Walking along a busy NYC street and amidst the hustle and bustle, one may be reminded of the purest human emotion … Love. So many questions, thoughts and memories are often ignited at the mere mention of this powerful word. Witnessing this emotion is a reminder to stop, to reflect, and to feel. “Public art challenges us to think. It turns a chance encounter into an experience. It visually transports us,” says ArtsWestchester CEO Janet Langsam. 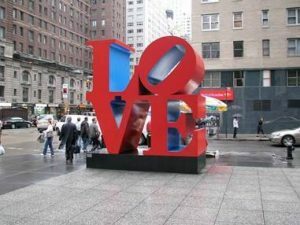 New York’s Love Sculpture by Robert Indiana, one of the most famous pieces of pop art, is located in midtown Manhattan, on Sixth Avenue and 55th Street. Dating back to 1958, this iconic sculpture is now reproduced in various mediums such as postage stamps and album covers, and can be viewed in at least five other locations throughout the country. While some people stop to take selfies for their Instagram, Facebook or Twitter accounts, others might find romantic inspiration when viewing this artwork. Typically, however people react to it, the sculpture has served its purpose… it has sparked creativity and emotion. As Valentine’s Day approaches, ArtsWestchester will be celebrating the universal language of love – music. Some patrons may remember the old-fashioned jukebox… that self-contained, coin-operated, music-playing box. As we reminisce about the “good ‘ole days,” ArtsWestchester invites guests and their loved ones to share a romantic night of sultry jazz favorites, where they pick the songs. 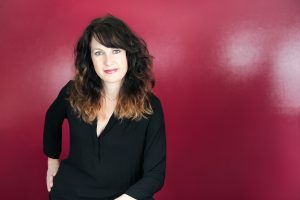 On Friday, February 15 (8pm), ArtsWestchester will refashion its own version of the jukebox experience by featuring award-winning vocalist Alexis Cole and her trio – John DiMartino (piano), Steve LaSpina (bass) and Kenny Hassler (drums) to play in its gallery. Cole will present a set of romantic jazz favorites, followed by a set that will be based on audience requests. Guests can even dedicate these songs to their loved ones. Cole is at the heart of New York’s jazz and cabaret scenes in addition to performing around the world. So whether one is planning a trip to New York City for long walks and hot cocoa, or staying local – grab a partner and set out on an adventure to reignite all the reasons to celebrate love!